The Sensory Science rave:mp 2300 MP3 player uses an Iomega Clik! drive.Each Clik! disk offers 40 MB of data and plays approximately 75 minutes of CD- quality music (depending on the format used). The 2300 comes with two Clik!disks, giving you 80 MB of memory to begin your MP3 journey. The rave:mp 2300also features a built-in microphone to record voice messages and allows you todownload Microsoft Outlook contacts directly to your Clik! disks, letting you totravel with your digital office files. The 2300 supports MP3, Microsoft WMA (Windows Media Audio), and AAC (AdvancedAudio Coding) formats, and has upgradable firmware to ensure futurecompatibility with new music formats and the SDMI (copyright protection)standard. I bought this MP3 player online, and it's great. This has plenty of memory at a very inexpensive price. I only use WMAs, because they are half the size and still superb quality. This is an amazing product that will blow you away! Great player until the battery dies. Anybody know how to get a replacement? Dont belive these bad reviews. You can get this player for $40 on ebay, and it is great. First of all it will Never, Ever Skip. SEcond it IS durrable I use mine while on my treadmill and have droped it many times. It plays perfect still.The trick is so songs dont cut out is you need to wait a few seconds before unplugging it from the computer. The volume is fine unless you enjoy being deaf! The screen is easyer to read then the small Mp3 players made today. RAVE MP 2100-Pretty darn good! I just got my RaveMP 2100, and I love it. I have heard a few other MP players and this one sounds as good if not better. The transfer time is also excellent. I think it's the faster parallel transfer I have ever seen. Takes only like 10-20 secs a song on my computer. I also love the other features like the built in mic that is very sesitive, great for recording meetings etc.. and the ability to store memos, contacts and phone numbers. Not to mention that is serves as a mini-harddrive and you can load any type of data on it to take to a friends house. I haven't seen any other MP3 player that can do all this. I would have gave it five stars, but the only drawbacks to this player is that it uses propritary mememory upgrade and currently can go only to 96 megs. That no a big deal since the player comes with 64 megs that seems like plenty for now. I would also like the volume to go a tad higher. It goes to 20, and it sounds pretty loud, but I use mine at 15, so that only allow 5 more before I max out, and as I age, my hearing might go as well. This again isnt a really big problem since you can just record your MP3 file at a higher volumn and sampling rate. If you in the market for a MP3 player, take a good look at this great player! note: You can put MP3's into this unit but you can upload mp3s back to a computer due to copyright restrictions. But another way around this is if you want to take mp3s to a friends house, just zip them up or rename them with a different extension and load them on the player as a regular file, and that way you can upload the mp3's to your friends computer. Pretty sweet huh? I wasn't sure what to expect, since this was my first mp3 player, but my experience with the Rave has been almost wholly positive. It's ultra light so I barely know I'm carrying it. The controls, while a little difficult to manage while the unit is in a pocket (let's hear that song again! )are pretty clear and, on the whole, simple to figure out even if you haven't bothered to read the instructions. Power use is minimal so batteries last quite a long time. With 64 Megs of memory you get about an hour's worth of music at what I think is a very reasonable price. I don't make much use of this unit for anything other than mp3 playback, but the multi-functionality is impressive. Above all, the sound quality is excellent. I don't like ear-bud type headphones, which is what this unit comes with, but that's my own problem, and it's really the only one I have with this player. For the rest, I am incredibly happy with its performance, which has been flawless. Device works great..however, there is no updated software that is XP compatable. Customer service told me that they were 'sorry, but the 2100 is no longer a supported product'. They suggested that I purchase a newer model that was XP compatable. Will never buy anything from Sonic Blue again. Listen to your favorite MP3 tracks from the Internet and your own CDswith the Sensory Science rave:mp 2200 MP3 player. The 2200 isn't just an MP3player.You can tune in to FM radio, record and play back voice recordings,store and retrieve telephone numbers, and download and view personal memos. Itcomes with 64 MB RAM of onboard memory and is expandable using SmartMedia memorycards. It features a durable aluminum case and no moving parts for skip-freeplaying. The USB port provides fast downloads, up to 350 KBps. The 2200 is compatiblewith PC systems using a Pentium 200 MHz or faster processor; Windows 95 SR 2.1or higher, 98, and 2000; 32 MB RAM; 40 MB hard disk space; and a CD-ROM drive. It comes with free music tracks from emusic.com, MusicMatch Jukebox software,and earbuds with and inline remote control that allow for easy access on the go. 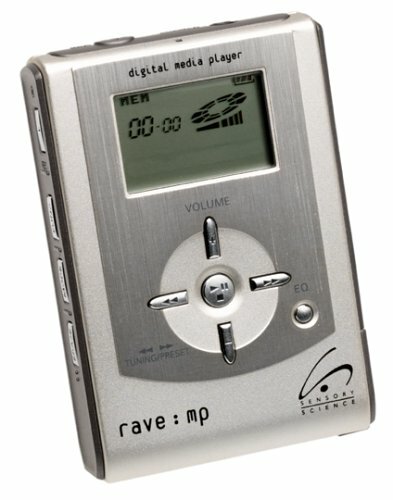 After reading every review I could find for the purchase of my first MP3 player, I chose the Rave 2200. It's terrific. Smaller than I expected, the sound quality is great. I love the added feature of the FM tuner which has very good reception. I use it at the health club and for rollerblading. It's easy to operate. I keep it in my pocket (with a safety pin to hold it in) and can change songs, volume etc. right through the material so I don't have to take it out. It took me a little while to figure out the software and get it loaded (I'm in my 40's after all!) but now I add/delete songs in minutes if the mood strikes me. I've used it daily for over a week and haven't gotten tired of the approximately 1 hour's worth of music it holds, although I've ordered a card for more memory for traveling. I changed to my Sony headphones because I don't like the earbuds and the sound it even better. Definitely the right choice! A gem! The rave 2200 is the best mp3 player in the market, it has great features like FM tuner, memo and telephone storage and a voice recorder. I have tried many mp3 player like the samsung yepp, RCA Lyra, and others and this player is the best. It has a very fast rate of downloading songs from your computer to the player via USB. It uses one AA battery which is great because you get about 10 hours of music in just one battery. One of the best things of this mp3 player is that it has an internal memmory of 64 MB and is expandable to 128 MB, plus it has many great and easy to use software to download songs from your computer to the player and to rip your songs from your cds. Overall a great product, which I recommend you to buy. Rave:2200 - Let the buyer beware! As an owner of a MP:Rave 2200 I found it to be a good MP3 player... up to a point. For me problems arose when I tried to use the Rave with Windows XP. My experience has been a disaster and until now it still does not work properly. What is even more frustrating is trying to get help on the problem from MP:MAN, SonicBlue and Sensory Science the creators and distributors of the MP:Rave. After months of sending E-mails I received only one response which was to ask for further details on the problem. The 2200 could be a great pleasure to use if only its creators were more customer focused. From my experience this is a sad commentary on a potentially great product. OK so i bought this last june and have loved it ever since. It has awsome sound quality with some good sony headphones and u can always turn on the FM. This would be a 5 star review if i was able to add on memory. My player would delete all the files i was trying to send into it after about 3 files. I was using a 64mb SanDisk card which is one of the best. Now i just have 64mb... o well its better then 32mb like some of the compitition. Its aluminum case feels very sturdy because i have dropped it a few times and have not lost any sound quality. Overall, if u have the bucks to get it, (i got it for $180) then get this player. If you want an awsome player with 128mb and u think ud use it all, check out the heftier Intel Pocket Concert.